With a new year, brings a new focus for many. And with that, one area that I would like to improve in my life is the energy and time that I focus on my children's education. Like other parents that work outside the home, I have 3 hours every weekday to make a healthy dinner, help with homework, bath the kids, read to them and get them tucked happily into bed. Let me tell you, it is a interesting evening, every Monday-Thursday. In an ideal life, every meal is planned, errands don't have to be run on a school night and I don't sit down to turn on E! News for a bit. But sometimes I do, and sometimes I have to run to HEB and we sometimes we eat out and spend an entire hour and a half at a restaurant. And this doesn't even include an extracurricular activities. It is always a balancing act and something has to give. And to be honest, sometimes reading, homework and afterschooling get put on the back burner...but I want that to change. I want to live intentionally, and have no regrets of the efforts we put forth as parents. 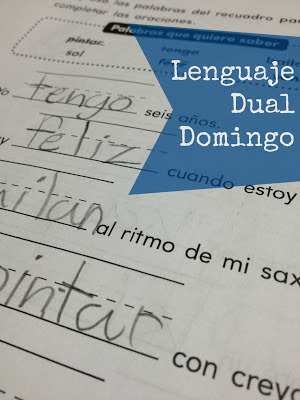 So, because my children are enrolled in a Spanish immersion class, I want to share our learning experiences with the dual language program. Hopefully, cada Domingo, every Sunday, I can share tips, favorite bilingual books, resources, and our growth in the program. I feel like this series will help direct my focus and energy into fun learning, helpful teaching and encouraging time to read and explore. I want my children to see and feel that education is important. Bueno, nuestro camino de lenguaje dual necesita un punto de partida, no? We need to start somewhere, right? You can read about why we chose Dual Language, in my MySA blog post, Kindergarten and the Dual Language Effect. Coming up this Sunday, I will reflect on how the first year went! I hope you enjoy this series and would love to hear any feedback! Im trying to get my munchkin into spanish (my first language and my moms main language) but he hasnt wanted to catch on yet so I would love some tips and good info on the subject. I hope that I can help in anyway! We didn't start until age 5, so it's not too late for your little one! Looking forward to your posts. So happy you are sharing.